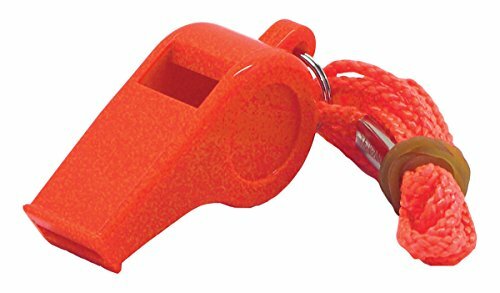 This Emergency Whistle could be a potentially important item and a life-saver. It can also be used for camping, boating, fishing, hiking and other outdoor activities Brightly colored easy to find it when you need it. SE is proud to present our 7-IN-1 Green Survival Whistle. This survival whistle is great for camping, hiking, hunting, fishing, outdoor activities, travel, emergency kits, survival kits, and more. Lightweight and compact—our whistle can easily fit into your pocket, backpack, survival pack, and purse. For easy storage and transportation, and can hang onto your neck, wrist, and gear with the lanyard. Features of our 7-IN-1 Green Survival Whistle include:(1) Safety whistle(2) 5x magnifier(3) Bright white LED flashlight(4) Storage container(5) Compass(6) Thermometer in Fahrenheit and Celsius(7) Mirror for signaling(8) Large button cell CR1220 batteries for longer life(9) Lanyard(10) Compact and lightweight for easy storage and transportation Important: Avoid getting counterfeit items. Genuine SE products come with our SE logo on the packaging. SE products are quality items for extremely reasonable prices. SE is committed to providing the customer with the best source for value possible on the market. You will enjoy the quality, function and usefulness this 7-IN-1 Green Survival Whistle has to offer. SE is a registered trademark protected by US Trademark Law.